Organic chemistry may cover many concepts and topics, but it’s all about the reactions and mechanisms. It’s not so scary at first, think about the simple acid/base deprotonation, an alkene reaction here, another there. Before you know it, you’re drowning in dozens upon dozens of reactions! You’re asked to ‘memorize’ each one, to know what every reactant and reagent will do. And once you have it all down, don’t forget the dozen or so exceptions to the rule. And once you have all THAT down, let’s put them all together: when you’re given molecule A and asked to come up with all 20 steps to produce product Z! Ok, perhaps I’m exaggerating a bit…but really, just a tiny bit! The average Organic Chemistry 1 or 2 exam synthesis question will range from two to five steps with intermediates. How do you keep everything you learned straight? And more importantly, how do you sift through the hundreds of data points in your head to produce the exact steps required to achieve the desired outcome? As a kid, I was proud to call myself a nerd. Perhaps with a bit of OCD. I always looked for trends and found patterns where they didn’t exist. Perhaps that’s why I enjoy Orgo so much. A) Look for patterns, as we’ll explain below. B) when you get stuck, remember there’s likely more than one way to reach your desired product. Coming up with a proper synthesis requires a combination of forward and reverse thinking! We’ll cover the reverse thinking in the Retrosynthesis tutorial. For this tutorial, we’ll focus on the shorter and simpler synthesis. Let’s start by looking for patterns. The following questions will help you understand what to pay close attention to. What functional group is present on the reactant? What functional group is present on the product? Which reactions do I know to convert from one to the other? Do I know of a reaction that produces an intermediate to the above product? These are the direct obvious reactions with potentially differing results. We’ll use 3-methyl-1-butene to highlight these difference. But what if you weren’t given the alkene, or didn’t think of these alkene reactions? 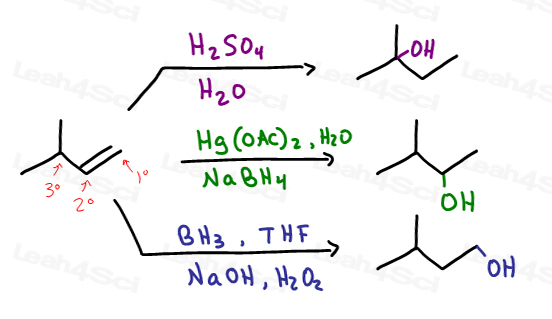 What about putting a halogen leaving group on the alkene through hydrohalogenation? Or a radical halogenation if starting with an alkane? Then you can carry out an SN2 reaction using NaOH in a polar protic solvent. What if it wasn’t that easy? 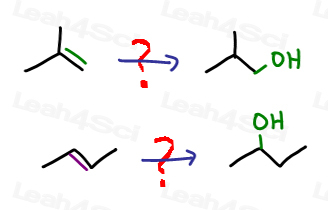 What if you’re asked to start with an alkyne? We can’t go from alkyne to alcohol directly, since the enol product would immediately tautomerize to a ketone or aldehyde. Let’s start with a simple example for concept, then apply the same logic to something more complicated. Acid catalyzed hydration of alkynes will yield a ketone following Markovnikov’s Rule. HOWEVER, in this example we’re starting with a 3-carbon chain yet ending with a 4-carbon chain. 4. Do I know of a reaction that produces an intermediate to the above product? Yes! Terminal alkynes easily undergo chain elongation via SN2. We’ll start with an acid/base reaction to deprotonate the terminal alkyne forming a good nucleophile. We need to elongate the chain by just one carbon. Let’s give this methyl group a good leaving group to facilitate a quick SN2 reaction –my ‘go-to’ is Bromine, but you can also use Chlorine or Iodine. Now that we have a carbon chain of desired length, let’s carry out the acid catalyzed hydration. But wait, the product is an enol, not a ketone!! The next step will happen automatically. So while you don’t have to show a reagent simply draw ‘KET’ over the reaction arrow for Keto Enol Tautomerization. This is where you’re given one reactant, one product, and ONE or TWO sets of reagents. In other words, you’re given all the steps but asked to show how the different molecules work together. While the question is completely different, the concept is the same. WHERE IS THE REACTIVITY ON THE STARTING MOLECULE? As in, where do I start the mechanism? A student recently showed me this exam question for which not a single student in his class got full credit. Let me preface this by saying YES, this is a tough question. BUT, if you think through it logically, you’ll realize that if you studied the individual steps and recognize them, you should be able to follow along. In fact, I challenge you to give this a try and see how far you get before reading on. Propose a reasonable mechanism for the following reaction. Show all intermediates and formal charges. Is this reaction SN1 SN2 E1 E2? No matter how well you prepare, you’ll still get caught off-guard by one tricky step or another. Chances are, there’s more than one way to derive your product! We were asked to outline a step by step procedure to separate two similar molecules with different functional groups. The process involved a series of reactions to prepare one molecule for extraction. I remembered that there were about six steps, but I could only confidently answer four. I’d already bombed, then aced Orgo 1, and didn’t want to do that again! No matter what I did, I couldn’t come up with the other steps. So instead, I crossed out my four and a half steps and wrote a detailed step by step procedure for carrying out fractional distillation. My TA very reluctantly gave me full credit with an amused warning. No one else came close. Am I asking you to outsmart the question? Just recognize that the more reactions you learn, the more options you have for creating a single functional group. Think back to the many alcohol formation reactions we discussed above. If you forgot one option, simply use another. Here are a few interesting patterns and alternates to consider. –> ‘Moving’ Reactivity so that you can start/react at a different portion of the molecule compared to the current location of the active group. Active groups include leaving groups, pi bonds, nucleophilic centers susceptible to attack and more. Move the Pi bond intermediate then apply a Markovnikov or Anti-Markovnikov addition. No pi bond? Radical halogenation to introduce a leaving group and THEN eliminate. These are just SOME of the tricks you can utilize. 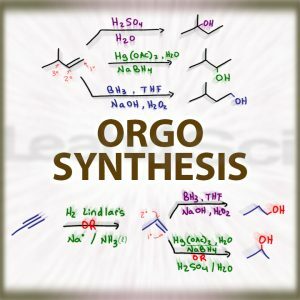 The average synthesis question is worth anywhere from 10-30 points. And the average professor WILL give partial credit. So, if you can only remember four of five steps, DO NOT leave it blank to receive zero points! Instead, write the four steps and add in as much relevant information as possible. Then VERY CONFIDENTLY fake the fifth step. Do not write “Magic!” (yes, I’ve seen this on a student exam). Make up something that appears to be just a ‘careless’ mistake. Your professor will be impressed by your work and hopefully give you an 80% for the question. This also applies to reagents! It helps you think without distractions so you can clearly see how the molecule and functional groups change/evolve from step to step. Now that you have a clear picture of where you’re doing, you should be able to retrace your steps and fill in the required reagents! Of course if Reagents are giving you trouble with this, here’s a video on ‘Memorizing’ Organic Chemistry Reagents. And if you can’t remember them, INVENT SOMETHING rather than leave it blank. Try to use a reagent that has the groups you’re adding. but you KNOW you’re trying to get oxygen onto the molecule, put something else with oxygen. For example: O3 or KMnO4. Both will cleave the alkyne. BUT, I’ve seen enough students use this as a legitimate mistake that your professor may think the same and hopefully give you partial credit. Again, I’m not asking you to invent on your exam. But, guessing logically on a multi-step problem where you’ve already earned sufficient points will help you get closer to full credit. I’ve done this successfully on my orgo exams and come out top of the class, despite missing half a point here and there on multiple questions. My Study Hall members and tutoring clients do the same thing to squeeze in a few extra points, bringing them to the top. Bottom line, make sure you learn and UNDERSTAND all of the required reactions! But even the best of us forget some things under pressure. That’s when you can utilize the tips above to help you try your best and you’ll have an advantage with most professors. They’ll hopefully give you the benefit of the doubt when answers are questionable or not exactly what they were seeking. Ready to start thinking backwards? That’s where the more difficult topic of Retrosynthetic Analysis or simply retrosynthesis comes into play.